June is mango month at Waitrose - so make the most of these delicious exotic fruits while they are at their best. This recipe uses large tree-matured mangoes which are ripe, ready to eat and really juicy. They are packed full of flavour and have a soft, non-fibrous texture to make a refreshing and healthy summer dessert. Using a sharp knife, slice the mango lengthways either side of the large flat stone. Place the 2 halves flesh side up and score a lattice into the flesh without cutting through the skin. Gently push out the skin to make the cubes stand out and slice them off. Discard the skin. Purée the raspberries in a liquidiser or food processor. 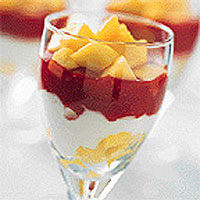 Divide half the mango cubes between 4 small sundae dishes. Top the mango cubes with the fromage frais, the raspberry purée and finally the remaining mango cubes. Serve chilled. As an alternative you could replace the fromage frais with 2 x 150g tubs Waitrose Natural Yogurt and the raspberries with 125g strawberries.